The Navigator is a tab dialog with tabs for Welcome, Tutorial, Examples, CLOS, About, and Sales Info. The Tutorial and Examples tabs are the most useful when writing programs. Tutorial: displays a brief description of the Interface Builder Tutorial. Clicking on the Start button starts the tutorial. Examples: displays a list widget listing example topics on how to write CL code. Has buttons Load, Run, and Edit. Load: causes the example code to be loaded (but not run). Run: causes the example to be run (loading it if necessary). Edit: causes the example source file to be displayed in a text-edit window. The examples do common things, especially with windows, dialogs and widgets. You can mimic the example code to achieve similar effects in your code. CLOS: displays a small description on CLOS. Click the Show button to view an excerpt from the book, ANSI Common Lisp by Paul Graham, 1996, which gives an excellent overview of ANSI Common Lisp and the Common Lisp Object System. 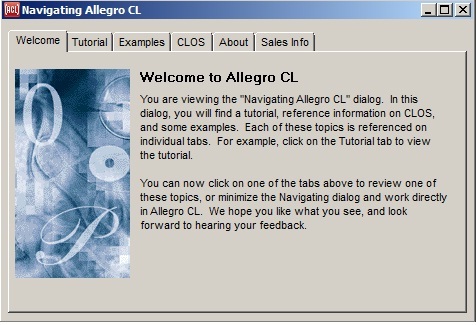 About: displays a short paragraph about Allegro CL. Sales Info: displays electronic mail, phone, web, and fax contacts for sales information at Franz Inc.